Japan's famous warrior caste, the feudal samurai, is as well-known as the Western's medieval equivalent, the knight. However, these ferocious warriors are shrouded in secrecy to most European audiences, lending them an enigmatic mystique that has rarely been equaled in the West. 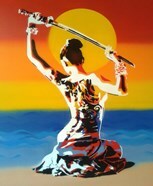 Because of this, fine art depicting samurai is in high demand among collectors of Oriental artworks. Paintings of samurai are done in the iconic stylization of Japan's traditional artwork. Since samurai were supposed to represent the masculine qualities of honor, ferocity, action, and uprightness, these representations of ancient warriors are painted using 'masculine' straight lines and angles. The 'feminine' partner of these paintings is the geisha, who are depicted with curving lines and collectors typically play these two opposites off of each other in their collections. The most iconic symbol of the samurai are the tools of their trade. The katana and traditional samurai armor are frequently worn by the subjects of samurai fine art. A samurai's armor consisted of leg armor, traditional Japanese sandals, a breastplate, and the iconic kabuki-style mask and helm. When samurai went into battle, they would wear these masks in order to frighten the enemy and cause them to lose courage. Because of this, many samurai wore vicious-looking helms that were designed to look like evil spirits. 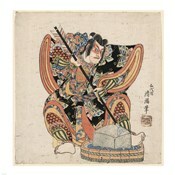 Fine art depicting samurai usually only have them wearing helms if the painting is of a battle, although the samurai are nearly always seen in their armor. There are exceptions to this however, such as if the samurai being drawn was in a state of dishonor or about to commit ritual suicide, known as seppuku, such as in the painting, 'Akashi Gidayu Writing His Death Poem' which portrays the disgraced warrior as a man with no armor. Samurai art can also serve as an aesthetically pleasing counterpoint to circular decor. Their naturally vivid colors are used liberally. Reds, blues, golds, and blacks are typically put on a background of beige or brown paper which allows them a surprising amount of versatility among retro designers.